As Apple has spent less time on its OS X Server platform, many IT admins have been inquiring about JumpCloud’s Directory-as-a-Service and whether or not it is a viable replacement for Apple Open Directory. The answer is yes! JumpCloud’s cloud-based directory service can be an alternative to Apple Open Directory. Open Directory is effectively a fork of LDAP v3. It is optimized for Apple products and is an on-premises solution, therefore if you have a heterogeneous environment and/or are in the cloud, there may be difficulties with using Open Directory. Macs have long lived outside the norm of IT infrastructure. Microsoft has owned the corporate platform space for decades until recently since their Windows operating system and applications were most often employed across a number of industries and organizations. As a result, their directory services solution, Active Directory, was the dominant player in the space. As Apple started selling more Macs in the last decade and has taken a significant share of the market from Microsoft, the balance of power is shifting. Nowhere is that felt more acutely than in how to manage users on Apple devices. As organizations shift to Macs or become exclusively Apple shops, Open Directory becomes a potentially useful platform in order to manage users. The challenge for IT admins becomes apparent as they look to make the shift to the cloud since their Mac OS X server software remains on-premises. With Apple eliminating the server hardware, complications with implementation arise as well. 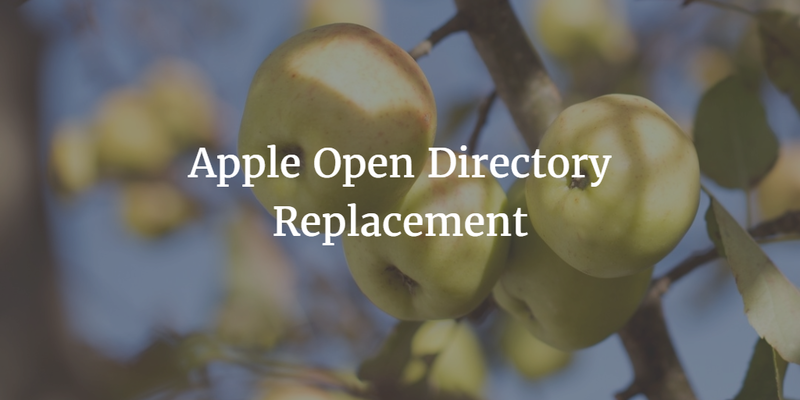 As organizations grow and become more dependent on a directory service that can connect users to not only their Apple Macs, but also to a wide range of other IT resources, Open Directory is no longer a viable solution. A core directory service for an organization needs to be able to manage all systems including any Windows machines that may exist and the Linux servers at AWS. Applications that are hosted on-premises or in the cloud should also be connected to the core user directory. Naturally, the security of the WiFi network is also of significant importance therefore,ensuring that each user has a unique login to the network is also critical. These components, among others, are the requirements for a modern directory service. Modern directories are becoming more and more cloud-based and independent. Ideally, a user store should work with any type of device or applications wherever it may be located and with whatever protocol it requires. That means that an LDAP application should be treated as equally as a Windows machine and a RADIUS WiFi access point. A directory tuned to Apple Macs may work for now, but over time and as an organization begins to leverage other platforms, a vendor neutral cloud-based directory service becomes more critical. If you would like to learn more about how JumpCloud’s Directory-as-a-Service could effectively replace your Apple Open Directory platform, drop us a note. We have a large number of customers that leverage Macs within their environment and we’d be happy to discuss the pros and cons of each platform. Or, if you would like to try our SaaS-based directory service, please sign-up for a free account.